For the American football player and actor, see Mike Henry (American football). Michael "Mike" Henry (born November 7, 1965) is an American voice actor, writer, producer, and comedian. He is known for his work on the animated TV series Family Guy (1999–present), where he writes and produces episodes along with voicing Cleveland Brown, Herbert, Bruce, and Consuela. Henry is also known for co-creating and starring in the spin-off, The Cleveland Show (2009–2013) and for his recurring role as Dann in the television series, The Orville. At the age of 24, after a brief career in advertising, Henry moved to California to pursue acting. There he began taking classes at the Groundlings Theater and performing stand-up comedy. After three years in LA, Mike returned to Virginia to shoot short comedy films that he wrote and acted in. During that time, Mike often acted in his brother Patrick’s student films at the Rhode Island School of Design. It was there that he was introduced to his brother’s college roommate, Seth MacFarlane. The two quickly became friends. "We immediately hit it off and cracked each other up and kept in touch," Henry says. Henry later moved to New York City where he acted in commercials, studied improvisation at the Upright Citizens Brigade Theater and wrote, produced, starred-in and co-directed (with his brother Patrick) comedy shorts for Lorne Michaels’ Burly Bear Network. Henry’s break came in 1998, when MacFarlane contacted him about being part of a new show called Family Guy. Mike agreed and joined the project as a writer and voice actor. Henry has stated that the inspiration for Cleveland's voice was based on "this guy that [he] had once played basketball with". 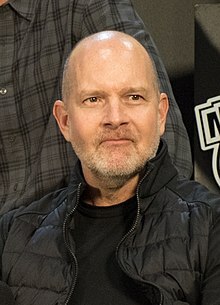 During the show's first four seasons, he was credited as a guest star, but beginning with season five's "Prick Up Your Ears" he has been credited as a main cast member. Since its debut on January 31, 1999, 306 episodes of Family Guy have been broadcast with Mike having credits in nearly all of them. Two episodes into the second season, Family Guy was taken off the network's permanent schedule and shown irregularly thereafter. The show returned in March 2000 to finish airing the second season which contained 21 episodes; all the cast came back for the series return. During its second season, Fox publicly announced that the show had been cancelled. Despite the announced cancellation, in 2001 Fox decided to make the third season. During the third season, Fox announced that the show was canceled for good. Soon after Family Guy was cancelled, Henry and his brother created the popular web series Kicked in the Nuts, a spoof of hidden camera shows. Family Guy was renewed again in 2005 for its fourth season due to strong DVD sales and its syndication on basic cable networks. Once again Henry and the rest of the cast came back for their voice works. In October 2017, Family Guy was renewed for its 16th season. On September 27, 2009, The Cleveland Show premiered on Fox. The project was created and executive produced by Henry, Seth MacFarlane, and American Dad! show runner Rich Appel. The show focused on the Family Guy character Cleveland Brown. Cleveland referenced the spinoff at the end of the Family Guy episode, "Baby Not on Board". The first season consisted of 22 episodes and was picked up by Fox for a second 13 episode season. The announcement was made on May 3, 2009 before the first season even premiered. Due to strong ratings, Fox picked up an additional nine season 2 episodes, bringing the total episode count of the show to 44. The show was renewed for a third and fourth season on May 9, 2011. The series was canceled after its fourth season on May 19, 2013 but reruns continue to air on TBS and on Cartoon Network's Adult Swim in the United States and on MuchMusic in Canada. The series ran for a total of 4 seasons and 88 episodes. Henry is married to Sara Voelker Henry and has two children, a son, Jack (b. October 2003) and a daughter, Josie (b. September 2007). They currently reside in Richmond, VA.
2007 Scrubs Urologist Episode: "My Point of No Return"
^ "Mike Henry of "Family Guy" talks voices, gags and instinct - Campus Times". Campus Times. 2008-09-11. Retrieved 2018-05-01. ^ a b c Itzkoff, Dave (2009-08-27). "With 'The Cleveland Show,' Mike Henry Spins Off Into Uncharted Cartoon Territory". The New York Times. ISSN 0362-4331. Retrieved 2018-05-01. ^ "'Family Guy' voice actor visits University - PantherNOW". PantherNOW. 2014-10-24. Retrieved 2018-05-01. ^ a b "Playing in 'Cleveland'". Backstage.com. Retrieved 2018-05-02. ^ "Welcome Back, Cleveland". Style Weekly. Retrieved 2018-05-02. ^ "Mike Henry (VI)". Metacritic. Retrieved 2018-05-02. ^ Burruss, Mary. "Voice of the People". Style Weekly. Retrieved 2018-05-10. ^ "Mike Henry: The Origins of Cleveland and Herbert". Retrieved 2009-04-16. ^ "Mike Henry of "Family Guy" talks voices, gags and instinct". Campus Times. September 11, 2008. Archived from the original on October 16, 2009. Retrieved September 8, 2009. ^ "Mike Henry". IMDb. Retrieved 2018-05-02. ^ Gilbert, Matthew (April 30, 2005). "Family Guy Returns, Just As Funny As Ever". Boston.com. Retrieved August 24, 2009. ^ Levin, Gary (November 18, 2003). "Family Guy may return". USAtoday.com. Retrieved September 27, 2009. ^ "Family Guy has finally been officially canceled by Fox". TKtv. May 16, 2002. Retrieved August 24, 2009. ^ McKinley, Jesse (May 2, 2005). "Canceled and Resurrected, on the Air and Onstage". The New York Times. Retrieved August 24, 2009. ^ James, Meg (April 13, 2005). "Fox Reuniting Itself with Family Guy". Los Angeles Times. Retrieved September 3, 2009. ^ Rosenthal, Phil (November 20, 2003). "Yet another Family reunion". Chicago Sun-Times. p. 53. ^ Levine, Daniel S. (2017-05-22). "'Family Guy' Renewed or Cancelled: Is it Coming Back for Season 16?". Heavy.com. Retrieved 2018-05-02. ^ "FOX Announces Fall Premiere Dates For The 2009–2010 Season". The Futon Critic. June 15, 2009. Retrieved August 23, 2009. ^ "Baby Not On Board". Family Guy. Season 7. Episode 4. November 2, 2008. Fox. ^ "'Cleveland' rocks at Fox". Archived from the original on 2012-07-03. ^ "Breaking News - FOX Picks Up Third Season of "The Cleveland Show" | TheFutonCritic.com". www.thefutoncritic.com. Retrieved 2018-05-03. ^ Hinckley, David. "Fox announces 2013-14 fall schedule, which includes return of Kiefer Sutherland's '24' - NY Daily News". nydailynews.com. Retrieved 2018-05-03. ^ "Fox Primetime – The Cleveland Show – Fact Sheet". Fox Flash. Archived from the original on January 17, 2010. Retrieved August 29, 2009.